VietNamNet Bridge – Many tourists are willing to wait in long queues and pay higher for a trip to explore the beauty of Son Doong Cave inside the Phong Nha - Ke Bang National Park in the central province of Quang Binh, a local newspaper reported. The Saigon Times Daily quoted Deputy Director of the provincial Department of Culture, Sports and Tourism Nguyen Van Ky as saying that only four tours with limited numbers of travellers are allowed to enter the cave. Bookings for the adventure this year have been closed. According to the portal of Quang Binh Province, the province only licenses seven-day and five-day tours to Son Doong Cave with each having a maximum of eight participants. The allowable tours to Son Doong Cave next year have been almost fully booked although departure schedules have not been announced by organisers. Travellers can make bookings for next year based on the “first come, first served” basis. Ky said tour organisers are finding ways to manage trips of fewer days to Son Doong Cave but still ensure that participants will be able to admire all the scenic sites of the majestic cave. 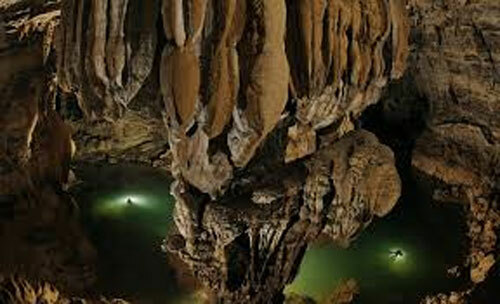 A seven-day tour to Son Doong Cave, inclusive of a one-day course, costs 3,000 USD a passenger. As Son Doong has been discovered recently, the local government of Quang Binh Province only allows Oxalis Adventure Tours to implement a pilot scheme of organising tours of the cave from March last year. The period for such tours this year is from February to August. In September when the wet season begins in the region and the tours of Son Doong Cave are suspended, the provincial authorities and Oxalis will discuss next year’s exploring season for Son Doong so as to meet the growing demand of travellers, especially foreign adventurers. After that, departures and itineraries for the trips to the cave will be publicized. Ky said the province has plans to allow more travel firms to arrange tours to Son Doong if they meet the requirements regarding safety for tourists, environmental protection and having specialists in cave and mountain climbing. Son Doong was discovered by the United Kingdom’s Royal Geographical Society in 2009 and is considered the world’s biggest cave. The cave is about 200 metres wide and over 150 metres high. Recently, the New York Times named Quang Binh as one of the most attractive destinations in Asia and eighth out of the world’s 52 top tourist destinations for 2014.